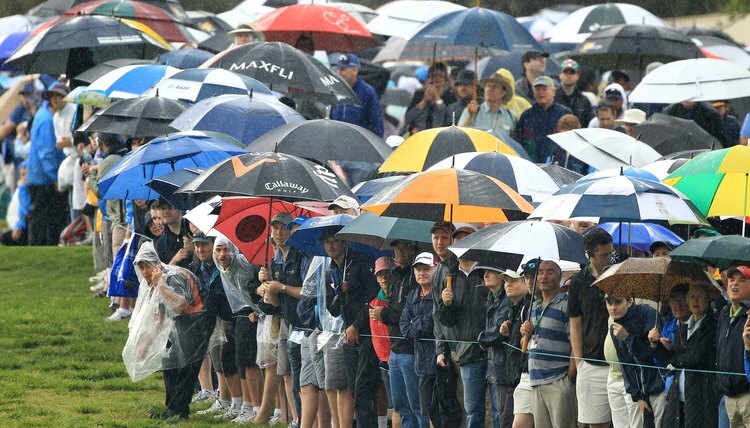 There can be several different causes for slow play, including weather. In golf, slow play is a situation where it takes longer than it should to complete an 18-hole round. If it normally would take 4.5 hours, during a slow play situation it might take 5 or even 5.5 hours. When play is extremely slow, golfers have to wait on every tee and every fairway for the group ahead of them to finish before they can hit their shots. Waiting diminishes the enjoyment golfers derive from playing the game. At many public courses, overcrowding is a contributing factor to slow play. The demand for tee times is so great that the time allotted between each group teeing off is relatively short. At private clubs where there are typically fewer players, the tee times can be spaced out further. The principal cause of slow play is the golfer’s individual behavior. Some golfers take too many practice swings before hitting their shot. They spend an inordinate amount of time looking for a lost ball. Having a large number of poor players on the course slows play simply because they hit so many shots. Courses that are extremely difficult tend to have slow play because golfers encounter so many hazards and take more shots. The length of time it takes to play a round of golf at many public courses is thought to be a factor in golfers deciding to quit the game, as Harry Hurt III cites in his book “How to Learn Golf.” According to the National Golf Foundation, the number of golfers in the U.S. declined from 30 million in 2005 to 27.1 million in 2009. Besides causing frustration for everyone on the course, slow play reduces the potential revenue a golf facility can earn in a given day. If it takes longer than it should for each group to complete their round, the course can’t book as many tee times. Slow play is a problem on the PGA Tour because between 144 and 156 players tee off at the beginning of the tournament--that’s a lot of players to get around the course. Because golf is their livelihood, some tour pros play so carefully and deliberately that their group falls well behind the group ahead. When that happens, a group can be put on the clock, which means they need to close the gap or risk a penalty. Chronically slow players run the risk of fines. The Tour strives to have each group complete rounds in 4 to 4.5 hours. Public courses that experience heavy play often employ rangers to ride around the course in golf carts and encourage slow groups to speed up. They also post tips on how to speed up play at conspicuous places such on the back of scorecards, on golf carts, or on bulletin boards in the locker room. What Is the Meaning of an Asterisk on a Golf Leaderboard?